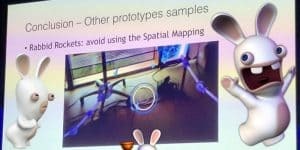 Rabbid Rockets Coming To HoloLens | Nerd Much? During the Unite Europe conference in Amsterdam, Ubisoft’s David Yue presented two AR titles for Microsoft’s HoloLens, mostly in relation to each titles spatial mapping technology. Which as far as I can tell, is to do with how the player interacts with the game and how the game elements are translated into real world dimensions. The first title presented was Toy Soldiers, which used said spatial mapping to make realistic versions of those familiar green men and allow the player to, apparently, pick up and place each soldier wherever you like. Once you’re done with your desired formation, you can watch them face off with each other. In contrast, Rabbid Rockets apparently only allows the player to interact via two robotic looking arms. The presentation slide, as posted by VRFocus, shows a targeting circle appear in the middle. This might be to shoot at the Rabbids in a kind of Angry Birds knock down method in your living room, or something else entirely. However we should keep in mind that these are prototypes, and Ubisoft might very well only be using them to explore the possibilities of HoloLens and AR before committing to a full game. AR has had a much tougher time becoming popular in comparison VR. VR has simply needed to become affordable with games that worked, with AR the technology is there but developers have yet to translate it to entertainment rather than education, as Microsoft has been doing so far. Nonetheless, this is a strong sign that the big name publishers are taking AR seriously and we might be seeing some interesting innovations in the future. HoloLens is currently the most pricey of them all, at $3000, but Microsoft is working on making that more affordable and likely coming to the Xbox One X too, not just the PC.